How Do We Get Turquoise Into the Wood Body Of Our Pens? Wood is an imperfect medium with which to use. 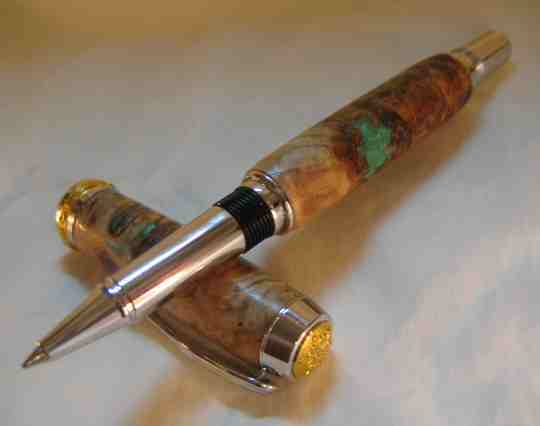 It takes a great deal of skill to get the pen, pencil, or other wood item to come out smooth, as our do. Still, wood still can have knots, and crevices. We have found that by using ground Turquoise, and mixing it with a special adhesive, we can pour it into any imperfections. Schermerhorn works the wood and Turquoise, creating a beautiful finished product. Perchin, Montblanc Prince Regent or Mont Blanc Semiramus, Esterbrook, Lamy, Parker. Pelikan, Sheaffer, Wahl, Eversharp, Ettore Bugatti, Stipula, Cartier ,Waterman, Parker, Omas, Aurora Primavera, Montegrappa Aphrodite, or other pen that will cost over $1000? What is a Cigar Pen? The perfect gift for Fathers Day, a Birthday, Graduation or Business Gift or for any occasion. Why pay for a Michel Perchin, Montblanc Prince Regent or Mont Blanc Semiramus, Esterbrook, Lamy, Parker. Pelikan, Sheaffer, Wahl, Eversharp, Ettore Bugatti, Stipula, Cartier ,Waterman, Parker, Omas, Aurora Primavera, Montegrappa Aphrodite, or other pen that will cost over $1000?